LIMITED EDITION Souver�n� M805 Raden Royal Platinum Raden is a traditional Japanese decorative craft mainly used for lacquer ware and woodwork. By working with small stripes of precious shell material, the artist of the Raden pen creates a beautiful, impressive piece of art. Each piece is truly unique. The first step to create the fountain pen Raden M805 Royal Platinum is to give the surface a deep black impression by using the special Japanese Urushi lacquer. Then the typical stripes are made with particles from the precious white mother of pearl shell. A platinum foil is carefully affixed one by one to the backside of the stripes. In the next step, the stripes are fixed to the cap and barrel by a coating of lacquer. Finally, the artist individually signs and numbers each fountain pen with the Maki-e technique, which used to be reserved exclusively for Japanese Royals as an indication of their power. With the limited edition Raden series, Pelikan applies this wonderful Japanese decorative craft to fountain pen models of its famous Souver�n� series. The Raden M805 Royal Platinum fountain pens are pieces of art with finely-chased and completely rhodanized 18 carat gold nib in the size M. Each fountain pen is encased in a traditional Japanese gift box which is made of Paulownia wood. Pelikan�s 180th Anniversary icon is an homage to the stylish creations that have piqued boundless desire for decades. Classic elegance meets a premium finish with each unique Pelikan piece reflecting the passion and skill of dedicated craftsmen. This M1000 model has high sheen silver ornamentation decorating the cap, rings and Pelikan clip on this anniversary edition. The barrel also appears elegant with fine sterling silver and soft guilloche. The famous pelican in the cap is guarding its chicks, represented by three radiant diamonds, in its nest. A silver-plated 18k gold M nib, with special engraving crowns the �Spirit of 1838�. All pens feature the engraved edition number of 180 pieces on the barrel. This beautiful new Raden Gold pen is crafted utilizing the Raden technique, a traditional Japanese decorative craft, which combines lacquer and woodworking, using inlays of shells, ivory and other fine materials and now made available as a very special Limited Edition. Raden Maki-e pens historically were created for Japanese Royals as an indication of their power. The first step in the creation of the Royal Gold Raden M800 fountain pen is to coat each pen with a special black Urushi lacquer. Gold stripes on the cap and barrel are then created using a 14 carat gold foil backing. These stripes are further enhanced with the addition of particles of white mother of pearl. A protective coating of lacquer is then applied to each pen, which is signed and numbered by the artist. All M800 Royal Gold fountain pens are true masterpieces and feature finely-chased 18 carat medium gold nibs accentuated with rhodium decor. Each pen is presented in the traditional Japanese gift box which is made of Paulowina wood. The Raden M800 Royal Gold pens are limited to 388 pieces worldwide. Just 20 years after the Temple of Zeus was finished in Olympia, the colossal �Statue of Zeus� was erected inside it. The Greek sculptor Phidias created the 13-meter statue between 438 and 430 BC and is recognized as one of the Seven Wonders of the World. According to legend, the Zeus statue was transported to Constantinople (today Istanbul) where it fell victim to a fire in the year 475. The work of art survived for around 905 years. The remains of its base can still be seen in Olympia today. The skin of the enthroned statue of the god was made from pure ivory. The ankle- length robe, the soles of the sandals and the tresses of hair were crafted out of gold, colored glass, and precious stones giving the statue a magnificent appearance. Using painstaking artistic processing, the motif of Zeus on this Souveran M600 size fountain pen. has been worked into the barrel in .925 sterling silver, and finally all decorative elements have been plated with 18 carat gold in an electroplating bath. To finish the motif and decorative elements, a clear varnish was applied in order for the background to be colored with anthracite tones. 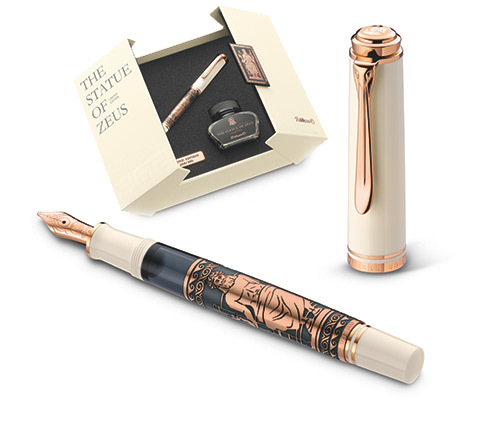 To create a gentle transition to the rose gold and emulate the ivory of the statue, Pelikan uses a precious resin in a creamy white color for the grip section, filling handle section and lid. The decorative elements such as the trademark Pelikan beak clip and the decorative rings, as well as the piece de resistance- the 18kt gold nib, available in M,F,XF,B - are all plated with rose gold. With this new Limited Edition, limited to 300 pieces worldwide, Pelikan once again creates a superior piston fill fountain pen. The New Special Edition M101N Bright Red has a unique presence and intense luminosity.The vibrant red barrel and cap sleeve are made from high quality acrylic with a distinctive marbled pattern. This quality synthetic resin, used to create the cap head and the filling handle, polishes itself as it is used, assuring that the Bright Red always continues to shine. The elegant marbling is in perfect harmony with the 24 carat gold-plated fittings. The 14kt gold nib is available in EF, F, M and B. This set is presented in a special gift box, which includes the 4001 Ink in a historical designed bottle. Raden is the traditional Japanese decorative craft used for lacquer ware and woodwork. The fountain pen M1000 Raden Sunrise Red is first painted in a deep red color, using the special Japanese Urushi lacquer. Then the colorful stripes are made with particles from abalone shell, which originates in the Japanese Sea. In the production process, the abalone shell is placed on the ground and flattened, with a hard stone, into very thin sheets. These sheets are cut into narrow strips and then affixed to the coating of lacquer around the cap and the barrel of the M1000 fountain pen. Afterward, the fountain pen is once again coated with lacquer, and then the surface is polished. With the Maki-e technique, originally reserved exclusively for Japanese Royals, the artist individually signs and numbers each fountain pen. In 1929, Pelikan registered the patent for the piston mechanism, a new fountain pen filling system. This technique, refined and updated, is utilized in this Limited Edition. The M1000 is ideal for people who write a lot as it has a very substantial ink capacity. The finely chased 18-carat gold nib is offered in Medium width, accentuated with a rhodium decor. Each fountain pen is encased in a traditional Japanese gift box, which is made of Paulownia wood. Only 333 fountain pens are available worldwide. The Pelikan Demonstrator, as a completely transparent product, was first launched to show how the piston mechanism works, and soon became a huge success. Especially technically interested people are fascinated to see how the barrel fills with ink. Following the last launch of the M800 Demonstrator in 2008, Pelikan now offers this unusual product as a Special Edition in the 805 profile with palladium plated trim. To harmonize the optical appearance, the 18kt gold nib is entirely covered by rhodium. It is available in F, M, XF and B width nibs. Pelikan will additionally launch an engraved version with technical descriptions in English engraved on the pen body, available in Medium width nib only. A historical model comes back to life. In 1937, Pelikan launched the M101N Tortoiseshell Red fountain pen which is highly sought-after today by collectors of vintage pens worldwide. In view of its appeal for its exquisite shape and coloring, Pelikan has introduced a special edition that replicates the main characteristics of this classic fountain pen. The tortoiseshell sleeve was originally made of celluloid and is now made of cellulose acetate. The rich Red cap and end pieces are made of high-quality resin and the clip and rings are 24kt gold-plated. The nib is 14kt gold as in the original, available in Medium, Fine, Extra Fine and Broad widths. Of course, the pen is piston-filled. As the original, this modern interpretation is a bit shorter than many of today�s fountain pens but is full-sized with the cap posted on the back end for writing. 4 13/16 in. closed and 6 1/8 in. with cap posted on back end for writing. The Pelikan Special Edition in a vibrant green color. The classic shape of the Souveran collection in the 600 size is combined with a vivid green barrel and cap, creating a perfect writing instrument for those who like to make a bold statement with their writing instruments. The series 600 Vibrant Green has the typical Pelikan characteristics: The barrel and cap are made of high-quality resin that is first turned and then polished to a high sheen. The differing patterns make each piece unique. The clip and rings are plated with 24 carat gold. The smooth twist action mechanism of the ball pen is a trademark of Pelikan quality. Raden is a traditional Japanese decorative craft used for lacquer ware and woodwork. The fountain pen M1000 Raden Sunlight is made with particles from abalone shell, which originates in the Japanese Sea. The size of the abalone shell is small, and the colorful parts in the rainbow colors that can be used for this precious fountain pen are particularly limited. In the production process, the abalone shell is placed on the ground and flattened, with a hard stone, into very thin sheets. These sheets are cut into narrow strips and then affixed to the coating of lacquer around the cap and the barrel of the M1000 fountain pen. Afterward, the fountain pen is once again coated with lacquer, and then the surface is polished. With the Maki-e technique, the artist individually signs and numbers each fountain pen. In 1929, Pelikan registered the patent for the piston mechanism, a new fountain pen filling system. This technique, refined and updated, is still used today. The M1000 is ideal for people who write a lot as it has the largest ink capacity of any piston fountain pen in the market today. The finely chased 18-carat gold nib is offered in Medium width, accentuated with a rhodium decor. Each fountain pen is encased in a traditional Japanese gift box, which is made of Paulownia wood. Only 300 fountain pens worldwide. Raden is a traditional Japanese decorative craft used for lacquer ware and woodwork. The fountain pen M1000 Raden Starlight is made with particles from abalone shell, which originates in the Japanese Sea. The size of the abalone shell is small, and the colorful parts in the rainbow colors that can be used for this precious fountain pen are particularly limited. In the production process, the abalone shell is placed on the ground and flattened, with a hard stone, into very thin sheets. These sheets are cut into narrow strips and then affixed to the coating of lacquer around the cap and the barrel of the M1000 fountain pen. Afterward, the fountain pen is once again coated with lacquer, and then the surface is polished. With the Maki-e technique, the artist individually signs and numbers each fountain pen. In 1929, Pelikan registered the patent for the piston mechanism, a new fountain pen filling system. This technique, refined and updated, is still used today. The M1000 is ideal for people who write a lot as it has the largest ink capacity of any piston fountain pen in the market today. The finely chased 18-carat gold nib is offered in Medium width, accentuated with a rhodium decor. Each fountain pen is encased in a traditional Japanese gift box, which is made of Paulownia wood. Only 300 fountain pens worldwide. FIRE - An Achievement of Civilization Limited Edition...The Power of Fire in the Hands of Man. Fire attracts people like magic. It provides warmth, light and a feeling of security. By learning how to control fire, early man took one of the most important instruments of mankind in hand. Fire gave him the freedom to form his own living conditions. No other achievement has so affected civilization or even made it possible in the first place. Pelikan has dedicated this limited edition to the power of fire in the hands of man. The fiery red fountain pen combines both sides of the element: its beauty and its unbridled power give distinction to the shaft, upon which richly lacquered tongues of flame open up into sparks of five, hand-set, precious topazes. Tamed fire is the motif on the cap and the beautifully etched 18 kt gold nib, available in Fine, Medium and Broad widths. Our forefathers already burned wood and used the glowing coals of 500 degrees Celsius and more to warm themselves and to cook food. Pelikan honors the ability of man to make fire useful and has restricted the amount of the limited edition *Fire* to 500 piston-fill writing instruments worldwide. The Silver Screen Limited Edition is a truly exclusive and distinctive writing instrument. Strictly limited to a production run of only 420 individual pieces, this pen pays homage to more than 100 years of American film history. Strikingly conceived in formal black with a shimmering silver cap and accents, and a white 18 kt gold nib, this pen is a true starlet: sleekly glamorous, the Silver Screen oozes charisma and retro-chic elegance. A ring of genuine celluloid and a silver inlay twirl around and along the barrel, calling to mind a strip of cinematographic film. Rubies of deepest red grace the center of the star of each frame and catch the eye with a splash of color drama! The pen is delivered in an exquisite, custom-designed presentation case, made of Japanese paulownia wood inlaid with black acrylic. Piston-fill, Medium width 18 kt gold nib. The Hanging Gardens of Babylon were a paradise created by human hand and have been immortalized in history as one of the Seven Wonders of the World. Ornamental columns and arched vaults supported the terraces and a highly-developed irrigation system ensured that the exotic trees, shrubs, flowers and herbs grew and flourished in all their glory. The project was the work of King Nebuchadnezzar II, created for his wife who longed for the trees and flowering shrubs of her native Persia. It was truly a Labor of Love, now honored in this exquisite, oversized limited edition masterpiece. The elegance of the stepped terraced structure borne on arches is the inspiration for the golden cap of this precious writing instrument. The deep green gloss of the barrel evokes the lush and verdent foliage of the desert oasis; the gold is testimony to the great Golden Age of Babylon. The edition of 410 pieces represents the work of Babylon priest and scholar Berossos from the 4th century BCE - the first scribe known to have ensured through his writings that this magnificent terraced garden would never disappear into oblivion. Piston fill in Pelikan's 1000 size profile, the large 18 kt gold nib is available in M, F and B widths. Pelikan�s Calculation of Times is dedicated to the creation of the calendar and man�s comprehension of time. The 800-size fountain pen has a barrel crafted in brass and ruthenium with gold-plating. On it, the 12 months are depicted by images from the Middle Ages, each one an activity or event associated with the seasons. The resin cap is engraved with a sundial motif; the phases of the moon can be found engraved on the crown. The 18K gold nib is embossed with the sun. Limited to 760 pieces worldwide. Bottle fill only. The Lighthouse of Alexandria fountain pen is a tribute to a technical and artistic masterpiece that is unique in its scale and significance and was one of the longest living wonders of the world. It was the tallest lighthouse ever built, at 440 feet (hence 440 pens in the edition) and one of the first of its kind. This oversized fountain pen is shipped under a glass dome modeled on the historic appearance of the Lighthouse. Built around 300 BC, the Lighthouse was detroyed by an earthquake in 1323 but the Tower inspired the imagination of numerous artists to this day. The beam emitted by the Lighthouse was visible for up to 31 miles and was an important navigational aid for the mariners along the Egyptian coast and at the entry to the harbor of metropolitan Alexandria. Pelikan's precision craftsmanship for this Limited Edition includes a lighthouse motif artistically designed on the pen's gripping shaft, with a dark blue varnished body, edged in gold plate, with the cap featuring four stylized lighthouse windows. Piston fill with a lightbeam design on the 18 kt gold nib. Since primeval times, humans have been using characters and pictures to communicate. Forerunners of the writing forms we now know today include cave paintings that are close to 20,000 years old. The earliest hieroglyphic examples come from ancient Egypt 5,000 years ago. That writing was used until 390 AD and included thousands of characters with which it was possible to formulate both concrete and abstract thoughts. The Egyptians used stone and clay as a means of writing, and then rolls of papyrus, leather and cloth which were artfully decorated with colored pictures. The Greek writing served as the basis for Latin and was the foundations for the original works of Plato and Aristotle, and the New Testament. With the EVOLUTION OF SCRIPT Pelikan honors the unique contribution of the various civilizations that made it possible to preserve knowledge and cultural traditions over the course of time with the invention of writing. The fascinating Temple of Artemis fountain pen is the latest addition to Pelikan's Seven Wonders of the World collection. The Temple of Artemis in the Ionian city of Ephesus (now modern Turkey) was the first temple built of marble and is considered the largest and most prestigious temple of the ancient world. As the Greek goddess of hunting, fertility and war, and the daughter of Zeus and twin sister of Apollo, Artemis is considered one of the 12 great Olympic deities. To honor and appease her, the temple was begun by Croesus of Lydia and completed in 440B.C. after 120 years of construction. Inspired by this architectural wonder, Pelikan has created a breathtaking fountain pen modeled after the Ionic columns of the Artemis Temple. The masterful, grooved barrel and cap are plated in palladium, and crowned with a gold-plated capital featuring a scroll on each corner. The grip section is engraved with the goddess Artemis as she once stood over her temple visitors. The precious fountain pen has a hand-engraved, 18K gold nib and a piston ink filler. Limited to 440 pieces worldwide, the Temple of Artemis is presented in an artistic case made of stone casting, modeled after the portal at the temple. an oversized 18kt gold nib, available in M, F and B. Piston Fill. The spectacular stage of our solar system is represented on Pelikan's limited edition Caelum. The top of the cap represents the sun at the center, its brilliant rays engraved into the cap and streaming toward the nine planets of our solar system. From Mercury to Pluto, the planets are engraved along the shaft. On the back, along the entire length of the cap and shaft is a gilded band with names of the planets crossed by planetary orbits. The shaft, cap, and barrel are framed in fine sterling and painted cosmos blue. Fill the Caelum with ink and generate new stories with the hand engraved 18k gold nib. Enclosed in a special limited transparent case with an arched lid.